Home Entertainment	Music Together classes are twin friendly! Just leaving the house with twin babies can be complicated. Changing, dressing and packing up two can be daunting, and that’s without accounting for how you’ll take care of them when you get somewhere – especially when you also have a toddler. For the first five months of our twins’ lives, Johnny and Wes got to go to our family breakfasts out every Saturday morning, to Costco and on the occasional walk. That was about it, other than visits to the doctor’s office or grandmother’s house. By the summer, I knew I owed them much more of the world out there! So when the cold and flu season ended, and our pediatrician gave me the thumbs up, I signed up for “Music Together” again. We’ve done both, Wade started Music Together as a baby on a recommendation from one of my friends, and he kept going for three more sessions until he was about 15 months and life got a little busier for Mama. 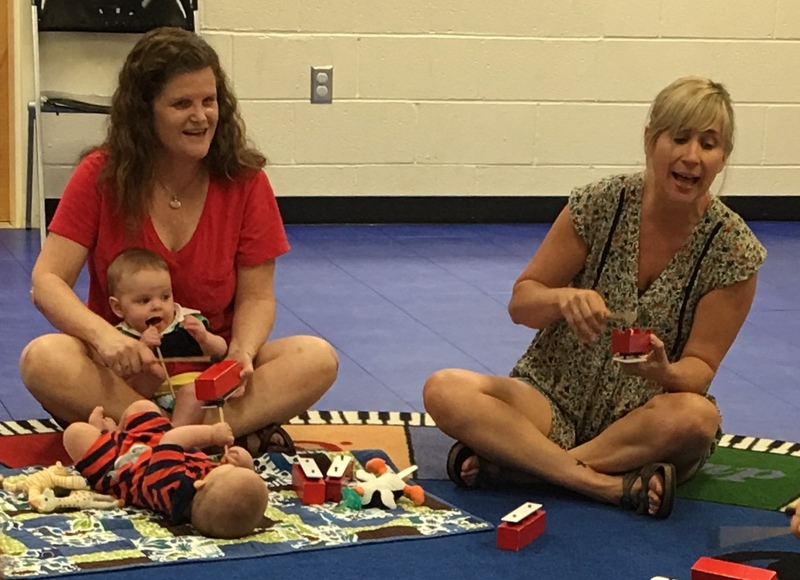 It was a way to get him acquainted with music in a fun atmosphere where children learn from each other as much as the teacher. Little tots love getting to see other tots, babies included, and nowhere do they see them better than while sitting in a circle on a rug. It was also a way to get us both out of the house for a fun activity and a way to meet other moms with kids the same age. What I also learned during the classes was that music gave me a great set of tools to communicate and engage with my sons before they could talk. Each session you take home a CD (and/or download the music on your phone.) All you have to do is casually listen to it a few times and both you and the kiddos are hooked. The first time I popped the CD in the car after Wade’s first Music Together class, I watched in astonishment as he started looking around the car like “Hey! I know this! Where is that coming from?” He was four months old. Not only was it fun to play little toy instruments with him and bounce him on my knees and follow the motions of the teacher like you do in class, it was fun to see the effect the music had on him outside of class. When he got scared the first time I washed his hair in the big boy bath tub, I chanted “washing your hair, washing your hair, washing and washing and washing your hair,” a cadence we learned in class, and he calmed right down. Whenever he cried in the car, my husband or I could pop in a Music Together CD and he’d immediately quiet down. Now as a family of five, with three boys under the age of 3, we survive on music. The wilder the atmosphere, the more soothing the music. (Think string quartet on the deck of the Titanic!) Whenever two or three of the boys were crying at once – which was not uncommon during the twins’ first three months – my husband would quietly tune “Alexa” in our kitchen to the classical pops station on XM radio. Ahhhh. I wanted to put the twins in Music Together, so they would get the same experience Wade did. And I wanted to do something just for them, without their older brother there diverting my attention. So this spring we did the babies class with Liz Seegers, and Johnny and Wes loved it. It was so fun to see them develop from looking around in amazement at first, shocked that there were other babies in the world, to recognizing the songs we sang and hand motions we did. I’d seen moms and nannies bring siblings to class when I was with Wade and everybody always seemed to be understanding of it. I’d still been a little intimidated at the thought of bringing both babies, so my mom was nice enough to come to class with us most weeks. I liked having her there in case one of the babies started fussing and needed to leave the room, and so that she could sit in the car with the twins when we left class to pick Wade up at preschool. But as it turned out, I didn’t really need Mom there after all. Liz and other moms were so helpful and the babies never fussed! They loved the music! So for any twin moms out there wondering if you can pull this off, you can! Not only did we, but I just signed up for another Music Together class this summer. This time I’m going to take all three of my boys. Crazy? (Not totally, I’m asking our part-time nanny to come with us. But still.) To find out how it went, stay, well, tuned. I’ll be blogging about Music Together again in August! 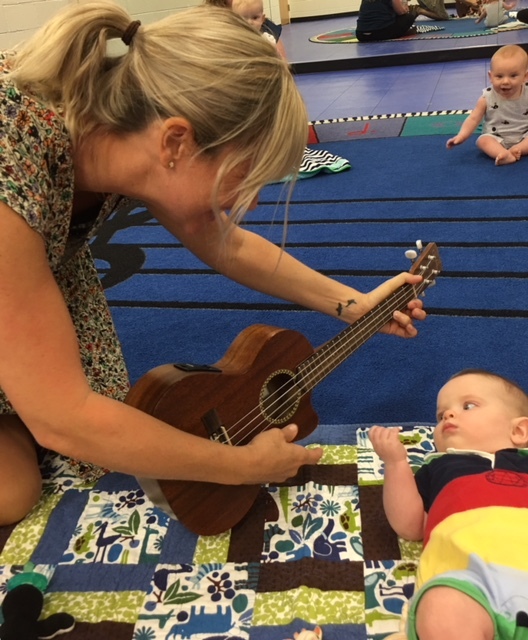 To find out more about the class schedules and to register for the summer session, go to http://www.musictogetherofcharlotte.com/classes.htm.